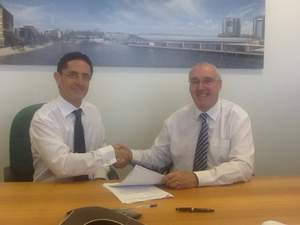 Charles Darwin University has announced a significant partnership with The Toga Group and the Northern Territory Government to develop a new tertiary education facility at Wharf Two of the Darwin Waterfront. The new development will see the CDU Higher Education and Vocational Education and Training (VET) Business schools move to the Waterfront site to become the new Charles Darwin University Business School. CDU Vice-Chancellor Professor Barney Glover said today that the world-class purpose built Business School would be the new home of 600 students across Business, Hospitality and Tourism. “The relocation of the Business faculty to the Waterfront facility will greatly enhance the potential for work integrated learning and the development of closer partnerships and collaborations with government and the business community,” Professor Glover said. “The University intends to combine VET and Higher Education business activities, restructuring programs to make them more accessible and more relevant to the dominant service, tourism and resources industries in the Northern Territory. The University will lease between 3500 m2 and 4000 m2 of space in a new purpose-constructed building, expected to be completed by mid-2014. “The facility will support contemporary teaching and learning practice, as well as integrating into the Waterfront development and establishing a central CDU presence within the city of Darwin,” Professor Glover said. Professor Glover said that no activity currently taking place on the Palmerston campus would be relocated to the Waterfront precinct from the Palmerston campus. “In fact it will be necessary to continue to expand VET hospitality and tourism programs at Palmerston campus to support the applied and sub-Bachelor pathway programs that are critical to much of the expansion at the Waterfront campus,” Professor Glover said.